Looking to get into goldfish keeping? If you’ve never set up a goldfish tank before, the first thing that comes to mind is probably that typical torpedo-shaped orange fish you can win at the fair. Little do many aquarists know that there is a whole world of goldfish (Carassius auratus) out there. Breeders have worked for over a thousand years to produce all sorts of selectively bred varieties. We’re not kidding here – this species was very popular in Ancient China. As a result of all this, the amount of (fancy) goldfish varieties available today is extremely varied. It ranges from fish that are very similar to the ancestor of our modern day goldfish (the Prussian carp, Carassius gibelio) to varieties so far removed from it you can barely recognize them. Interested in finding out which types of goldfish you own or which variety would work best for aquarium? 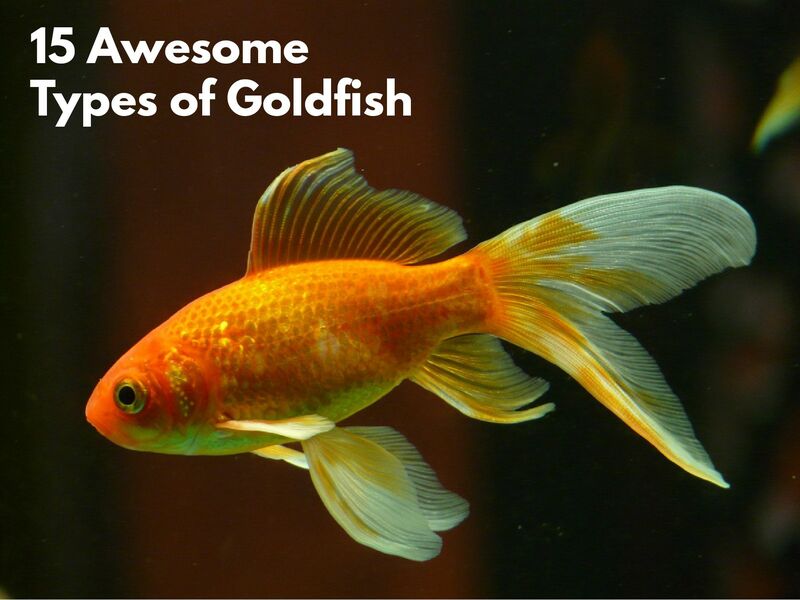 Keep reading for a description of 13 goldfish types, ranging from very popular to quite rare. Looking for general information on goldfish care instead? 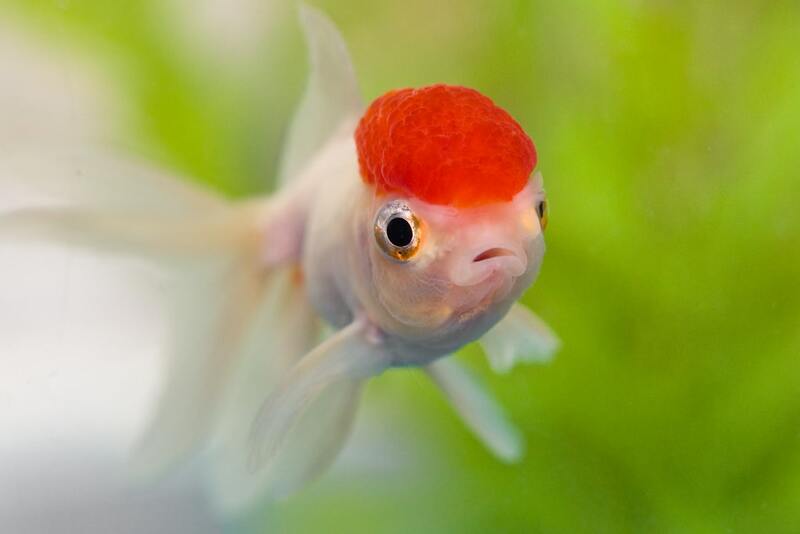 We included care tips for both fancy and common goldfish at the bottom of this article. Single-tailed goldfish are so called because – you guessed it – they have a single tail. They are “non-fancy” goldfish, which means that physically they still resemble their Prussian carp ancestor pretty closely. Their bodies are slender without any extensive modifications aside from color and possibly a selectively bred long, flowy tail. The most unassuming of all goldfish is the one every fishkeeper and non-fishkeeper has seen and likely even owned at one point. 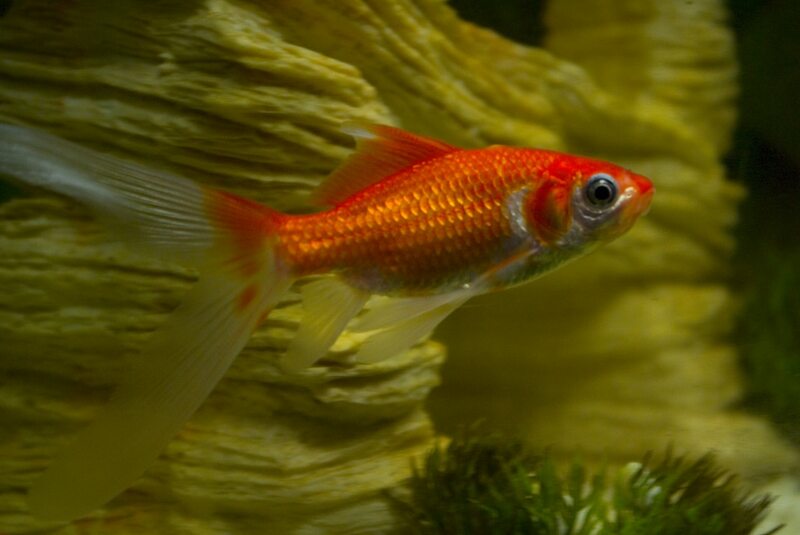 Common goldfish are your average orange, yellow or white childhood pet and also a common feeder fish. This variety features an elongated body and a short, single tail. It can grow to a rather impressive adult size that many aquarists might not expect: the largest goldfish in the world was a whopping 19 inches. Although not all common goldfish grow this large, they still generally reach a size of at least around 10 inches if conditions are favorable. Comet goldfish are another common single-tailed goldfish type. The difference between comets and common goldfish is in the tail. Commons have a short tail (also referred to as caudal fin), whereas comet goldfish feature a longer and flowier caudal. Quite a decorative sight when viewed from above in a pond! Like commons, comet goldfish can be found in orange, yellow or white. Additionally, you might also be able to find white comets with blotchy orange coloration. Comets, too, grow quite large and can reach sizes similar to those of common goldfish. Shubunkin are a type of goldfish bred almost exclusively for their coloration. The “standard” version of this variety (known as the American Shubunkin) is almost identical to comet goldfish save for its calico pattern. Shubunkin’s spotted patterns appear in a range of colors including orange, blue, white and black. Pretty decorative, especially considering their mix of matte and shimmering scales. 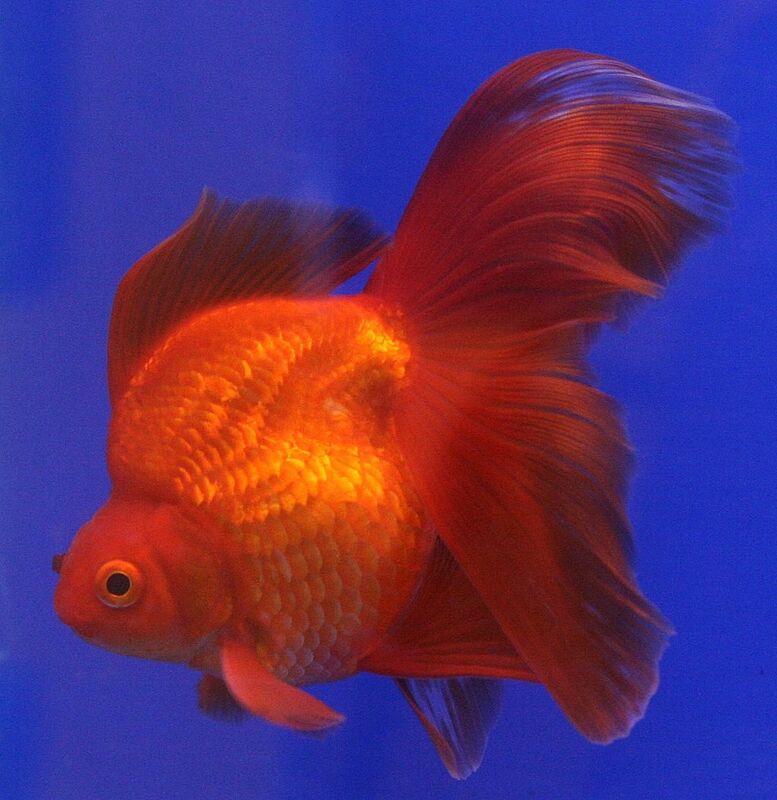 Looking for a Shubunkin that looks more similar to the classic common goldfish? You might like the short-finned London Shubunkin. For something a little more dramatic you can consider getting Bristol Shubunkin, which have long heart-shaped tails. Both of these sub-varieties will be more difficult to find, but you can try contacting other hobbyists to see if they’re selling any. The Wakin goldfish is a bit of an odd duck. It almost seems half fancy and half non-fancy, with a double tail but an elongated body. It is suspected to be the ancestor of the fancy goldfish types we know today, but most sources categorize it as a common due to its body shape. Long-bodied goldfish like commons and Wakins grow larger than stockier fancies. Additionally, they are much more active swimmers. For this reason the Wakin is seen as a pond fish; in fact, in its country of origin you’ll likely see more Wakins in ponds than the commons we keep here. “Fancy goldfish” is a collective name for goldfish types that have been selectively bred to exhibit all sorts of physical traits that single-tails don’t. As a rule of thumb, all fancy goldfish have double tails. Additionally, they feature a different body shape than commons. Rather than elongated and torpedo shaped, fancies have short and stocky bodies. They are generally slower swimmers and more sensitive. Most don’t respond well to very low temperatures and are best kept indoors. Don’t mix fancies and commons: the latter will outcompete the former for food, leaving the fancies hungry. Fantail goldfish are probably the most common fancy goldfish type out there. They feature the standard fancy goldfish egg shape, an elongated back (dorsal) fin and most notably, a long and flowy tail. Fantails are considered the European version of the Ryukin goldfish (discussed below). If you’re looking to get into fancy goldfish keeping, fantails might be a good choice. Unlike many of the more “extreme” fancy varieties that require extra care due to their body modifications, the fantail is quite hardy. Although it’s a little too slow to be kept with single-tails, it’s still quite agile and might actually outcompete slower fancies for food. Ryukin goldfish are considered the Eastern version of the fantail. The difference is in the body shape: Ryukins are very tall goldfish with a significant shoulder hump right behind the head. In fact, this variety is often taller than it’s long! Unlike other fancies, Ryukins have a slightly pointed head. Their tail can be either short or long depending on the variety, with some Ryukins featuring a tail twice as long as the body. Ryukin, like fantails, are known for being among the larger fancy goldfish types out there. If you’re interested in keeping them consider a larger aquarium than you might for other fancies. Or go for a pond; Ryukin are quite hardy and deal with lower temperatures relatively well. If you’d like to keep Ryukin, keep in mind that they look very similar to fantails when young. As with many other fancy goldfish, their selectively bred traits (in this case the shoulder hump) aren’t very pronounced when the fish is still small. It isn’t until your Ryukin grows larger that it develops the typical tallness. Even then, the degree to which the shoulder hump grows depends on the quality of the fish and other factors like diet. When it comes to goldfish, the pearlscale is definitely one of the stranger types out there. This variety is oddly reminiscent of a golf ball, as it was selectively bred for an extremely round body and thick scaling. If you’re looking into keeping pearlscale goldfish yourself, keep in mind that they’re not the best choice for those just starting out with fancies. Due to extensive selective breeding this variety isn’t always the hardiest, so you’ll have to provide pristine water quality at all times. Additionally, you might have to prepare yourself for issues with the fish’ swim bladder. Their body shape has been altered so extensively that in some cases the swim bladder fails to function correctly any more. We’re jumping straight to the most strange-eyed fancy goldfish out there. 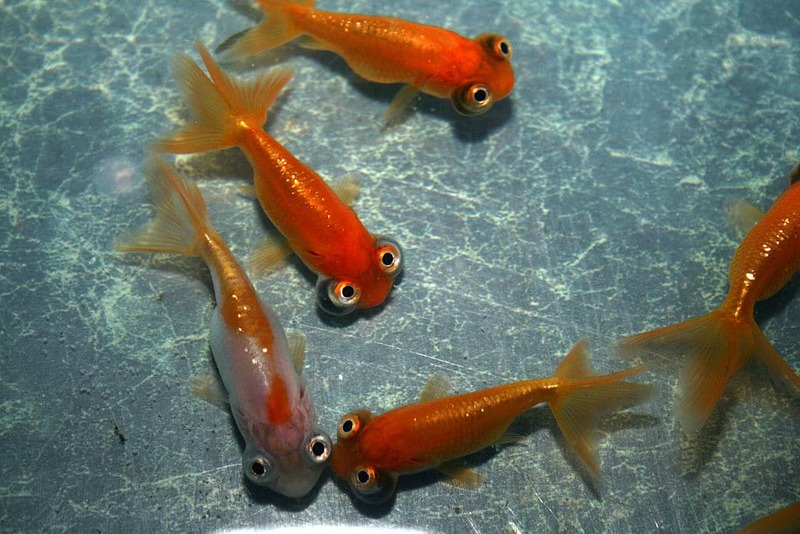 The bubble eye goldfish is quite appropriately named: this variety has been selectively bred to feature water-filled sacs under its eyes. These sacs grow as the fish does and can eventually reach a rather impressive size. It goes without saying that bubble eye goldfish need specific care and aren’t a great beginner choice. 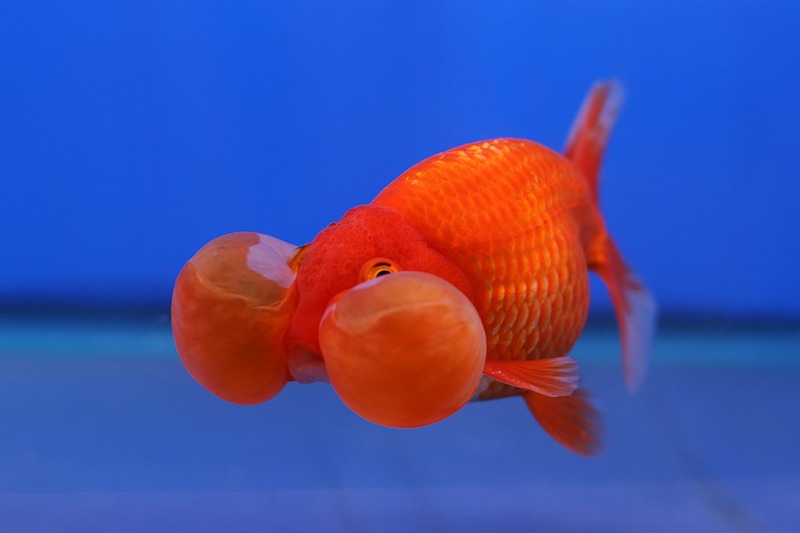 You’ll have to bubble eye-proof your aquarium by removing any objects that might be sharp and placing a prefilter sponge around the filter intake. Their bubbles are very fragile and can actually pop when damaged. Although this doesn’t cause permanent eye damage and the bubble might regrow, there is always the risk of infection. Additionally, be sure not to combine bubble eye goldfish with anything but other very slow fancy goldfish varieties. Faster ones, like Ryukin, will outcompete bubble eyes for food. One of the most well-known fancy goldfish out there today is the telescope eye goldfish. As its name suggests, this variety is known for its round, protruding eyes. This variety is also commonly referred to as Demekin, its original Japanese name. Telescope eye goldfish come in several “subcategories”, including the popular black moor and sought-after panda telescope. Although telescope eyes are less fragile than bubble eyes you should still take great care to protect their eyes. Damage can result in complete loss of the eye and possibly infection. Always place a protector around your water change hose and use a prefilter sponge to avoid accidents. 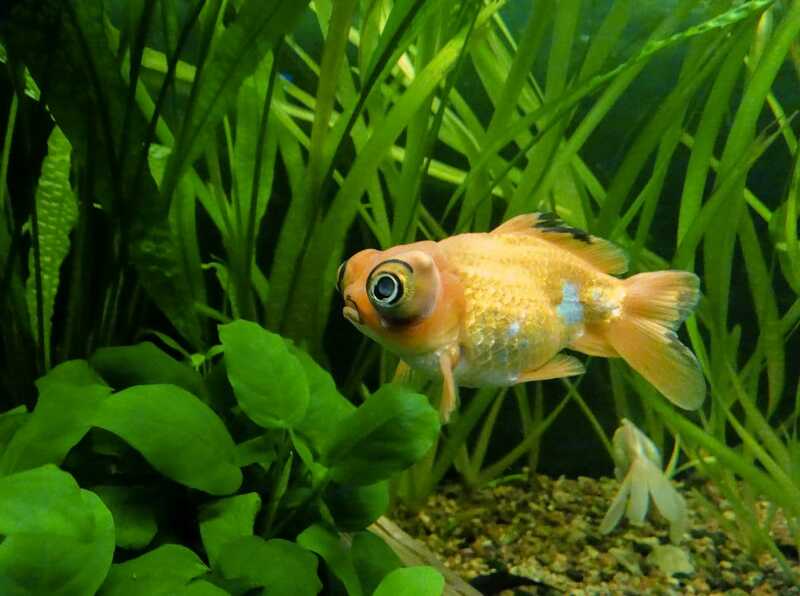 The rather unusual celestial eye goldfish resembles a telescope eye and was selectively bred from a mutation of this variety. There is one clear difference that easily allows us to distinguish between the two, though. Celestial eye goldfish have eyes that point upwards rather than to the side, hence the name. Additionally, celestials lack a dorsal fin. This variety has been around for a long time and its origin likely dates back to the 18th century. If you’d like to keep it in your aquarium, keep in mind that the celestial’s upturned eyes mean its vision isn’t exactly fantastic. Although these fish are quite active they should be protected from sharp objects and will not be able to compete for food with tankmates with better vision. 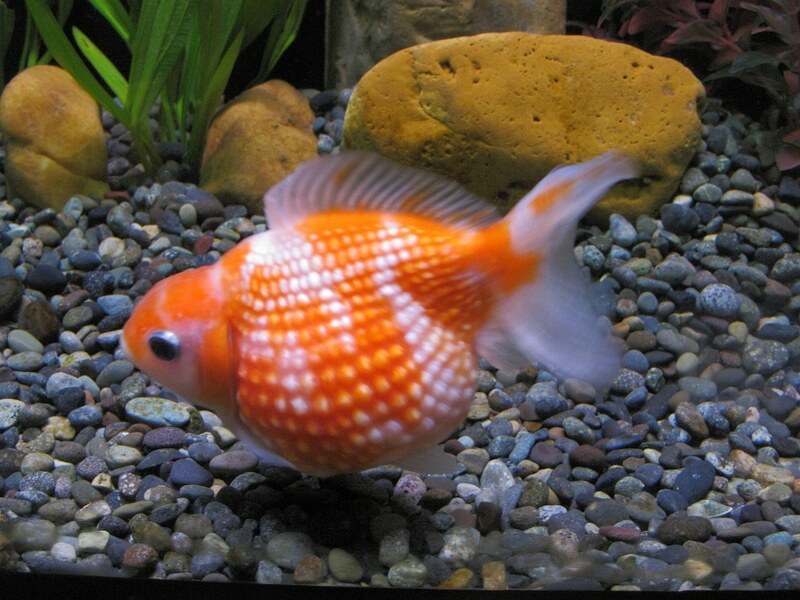 One of the more well-known fancy goldfish varieties is the Oranda. 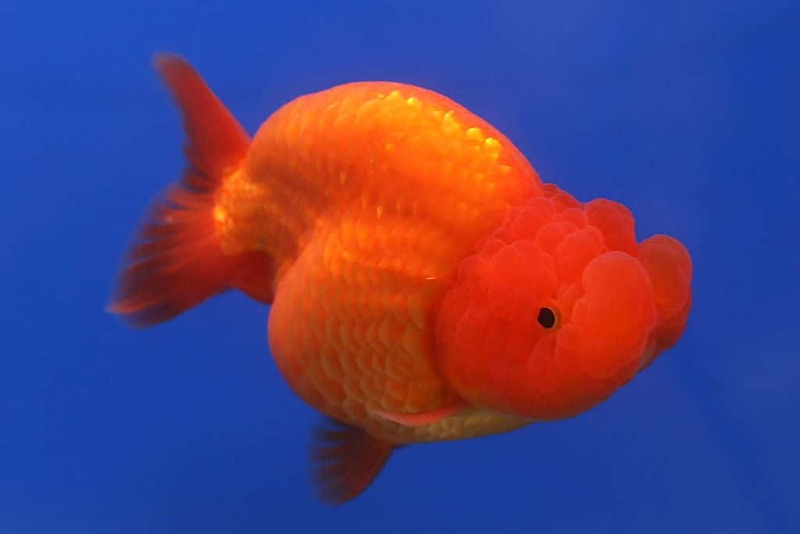 This goldfish was selectively bred for a fleshy mass on its head known as a wen, which some feel resembles a lion’s mane. 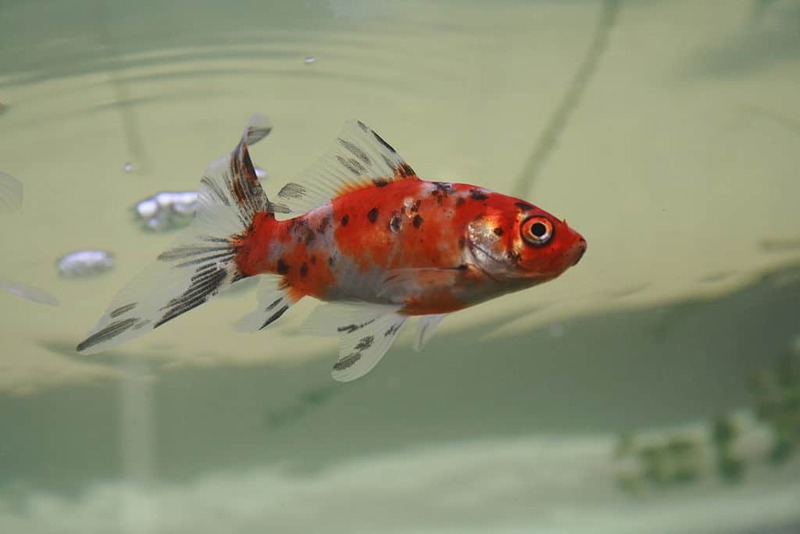 Oranda fry start out their lives looking almost like a normal fantail goldfish, with the wen becoming more prominent as they age. Orandas are one of the hardier and faster fancy goldfish types out there, especially when their wen is still small. Do keep in mind that the headgrowth should be protected from damage to prevent infection. In some fish the wen might grow excessively, prompting goldfish enthusiasts to gently trim it with clean scissors. Obviously not something you should be attempting if you don’t know what you’re doing, but it is an option: the wen doesn’t contain any blood vessels. These two fancy goldfish varieties are very easily confused. Both feature wens and lack a dorsal fin, but with some practice you should be able to see the difference. Lionheads will have a fuller headgrowth that appears to stick up from the head more and fuller cheeks. Additionally, their bodies are more elongated and the angle where the back joins the tail is less acute. Although lionheads and ranchus are two different varieties, their care is largely the same. Because they lack a dorsal fin these fish can be rather slow. Additionally, if the wen covers the eyes it can significantly impair their vision. All this means they won’t be able to compete for food with more “able-bodied” tankmates. In fact, they should ideally be kept in an aquarium containing only other ranchus and lionheads, although other slow varieties work as well. If you’re reading this article that probably means you’re interested in keeping (fancy) goldfish yourself – or you might already own your first one. We have to note that unfortunately, many goldfish end up in unsuitable homes. The myth that goldfish can be kept in bowls, vases and small tanks still seems to persist, which means many of these fish pass away prematurely. The problem is greatest for common goldfish. Because a feeder goldfish sells for just a few cents and these fish even be won at your local fair, not many aspiring goldfish keepers actually look into what kind of care their new fish needs. As we’ve discussed in the section on commons, these fish can reach quite a size. 10 inches is not uncommon for a well cared for goldfish. Most never grow to their full potential, however: a goldfish in a small bowl or tank will end up stunted in its growth. This is a mechanism developed by the wild Crucian carp in order to attempt to survive a little longer when the lake dries out or overcrowding occurs, so the fish can hopefully make it until conditions improve. 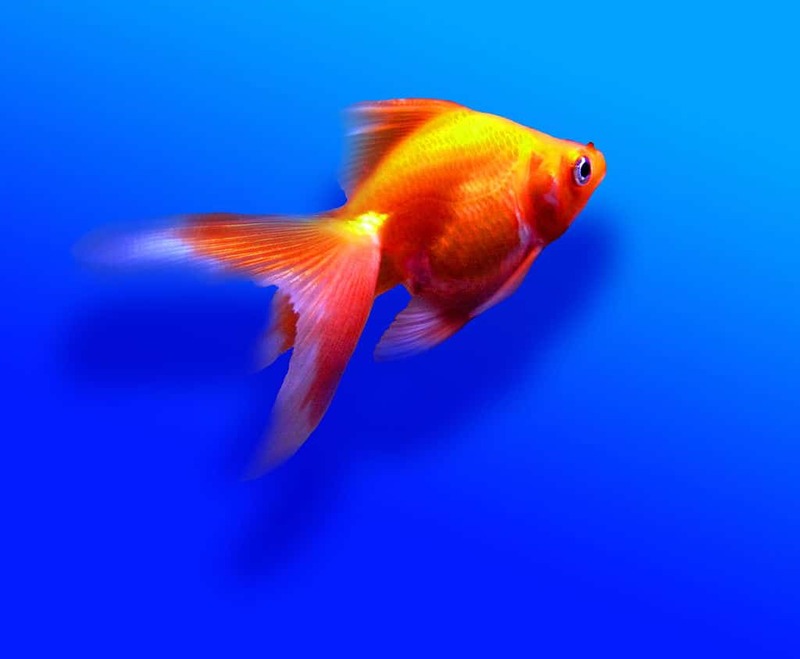 The fact that a goldfish in a small body of water stays much smaller is part of what spawned the myth that this species doesn’t need much room. In reality, a stunting is a sign of extremely unhealthy conditions. Not to mention the way ammonia and other harmful compounds build up in such a small amount of water! So: we’ve established that a goldfish, whether common or fancy, will need a lot of room to thrive. If you were to want to keep common goldfish, what kind of environment would work, then? Much to the surprise of some, our answer is that you should only keep commons in a pond. These fish are so active, produce so much waste and grow so large that they need up to 100 gallons per fish to thrive and prevent stunting. A well-filtered pond of at least 200 gallons with at least two goldfish (they are social beings) is therefore your best choice. Temperature is not a problem, as commons, comets, shubunkin and wakin are winter-hardy. As we’ve discussed, fancy goldfish tend to stay smaller than commons. Additionally, they’re less active and most species aren’t winter-hardy. Does that mean they can be kept in bowls or a small tank? Still a no on that. Luckily, though, you can enjoy them indoors in an aquarium as long as you provide what they need. Fancy goldfish keepers largely agree on a rule of thumb of 20 gallons of water per fancy goldfish, accompanied by what would be overfiltration for a normal fish tank. This means you’ll be looking at an aquarium of at least 40 gallons, given the fact that goldfish are group animals that look to their tankmates for safety in numbers and are clearly uncomfortable when kept alone. For Ryukin and fantails it’s generally advised to go even larger than the 20 gallon rule. That being said, just try to provide as much room as possible. It’s hard to imagine how the small fancies being sold at pet stores can grow to the size of an orange, but they can! An adult fancy will make a 40 gallon aquarium look small. In fact, the author at one point provided 30 gallons per adult fancy goldfish and definitely felt the need to upgrade the aquarium as it still seemed very small. Because goldfish produce so much waste and fancies are quite sensitive, you’ll have to watch the water quality like a hawk and stay on top of water changes. 50% water changes (or more!) twice a week are not uncommon for goldfish keepers!